It’s the most wonderful time of the year...for you to reach holiday shoppers with your brand and products. We know shoppers come in all shapes and forms, researching and buying across screens and in-stores. That’s why you need to ensure that you’re reaching your target audiences across all the premium publishers where consumers are already spending their time, both on the web and in apps. Last week, we announced that native ads and mobile video interstitials are now available to buyers on the DoubleClick Ad Exchange. These high-impact formats, coupled with the cleanest (fraud-free) inventory and the broadest reach of premium inventory, help you accomplish your campaign goals at scale. 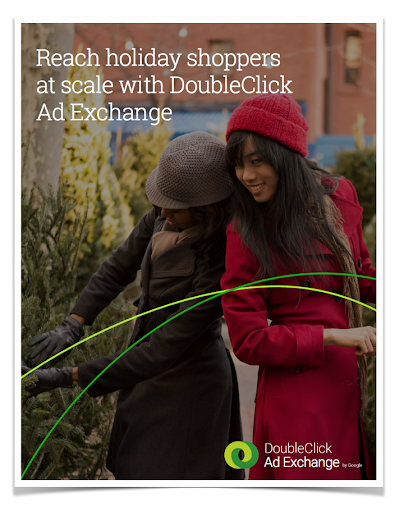 Check out our holiday guide to learn more about how DoubleClick Ad Exchange can help you reach holiday shoppers this season. You know your customers and their preferences better than anyone else, but reaching these users as they explore sites and content online can be challenging. 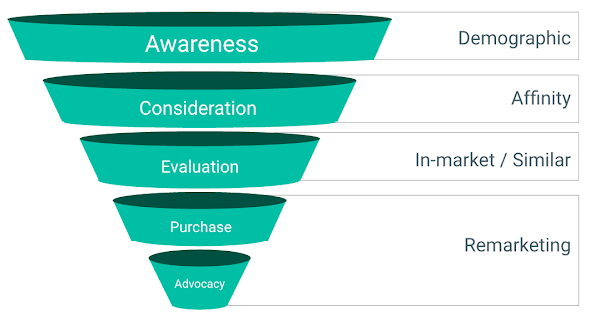 That's why we're excited to bring additional audience targeting options to DoubleClick Bid Manager to help you connect with customers at the right moments with the right message. Bid Manager now enables you to target your campaigns by demographic, affinity, in-market, and similar audience profiles to help you precisely reach users who are most likely to care about your brand or product. These targeting options complement any first and third-party data you may already be using in Bid Manager. Demographic: Demographic targeting is what it sounds like-a way to find your target by age and gender. It can help you reach a specific target based on stage of life to continue to serve the most relevant messages to consumers. Affinity: Affinity audiences can help you move beyond demographics and reach people who care about your brand. With over 80 unique personas based on lifestyle and interests, affinity audiences mimic the depth and breadth of TV-style audiences, so you can engage with precise audiences at scale. In-market: Reach potential customers while they're actively browsing, researching or comparing the types of products you sell. Connect with those most interested in what you have to offer, using precise segments that classify users based on their demonstrated in-market behavior and purchase intent. Similar audiences: Similar audiences looks at data about your existing remarketing audiences and finds new and qualified consumers who have shared interests with that audience. It's a powerful - but simple - way to reach a much larger audience and drive clicks and conversions among new prospects. Suppose you're a sporting goods retailer and have just secured sponsorship rights for a series of biking events. You want to maximize this opportunity by also reaching users who are interested in purchasing a new bicycle in order to drive sales. Users with this intent may browse sites or content online as they begin to consider purchasing a new bicycle. Other users may be actively browsing product listings and committed to purchasing a new bicycle. Each user represents an opportunity, and Bid Manager's audience targeting can help you reach the right user at exactly the right moment. For example, affinity targeting can be used to reach biking enthusiasts who are currently considering purchasing a new bicycle. In-market targeting can then be used as the user begins evaluating different bicycles to purchase. “We worked with Mindshare to drive awareness of our yogurt brands in women of different age groups in Italy. Google Demographic Targeting in Bid Manager helped us achieve our target coverage against this demographic and increase engagement, with a 20% uplift in CTR." These new audience targeting options are available today in DoubleClick Bid Manager. Learn more. As the holiday season gets underway, you’re likely focused on reaching holiday shoppers as they browse for gifts for their family and friends. Dynamic creative strategies are key to getting the most relevant messages and products in front of these shoppers. But with consumers’ increased usage of mobile devices, you need to build your dynamic creative in HTML5, and this confluence of technologies can lead to complexity. To make it easier for you to build relevant and engaging cross-screen creative, we’re excited to announce the launch of simplified workflows in Google Web Designer that make it even easier to build dynamic creative in HTML5. You can now easily choose which data signals/feed attributes to connect to each dynamic element, pulling directly from the dynamic profile you’ve set up in DoubleClick Studio. We’ve already seen some teams find success with the new dynamic workflow. 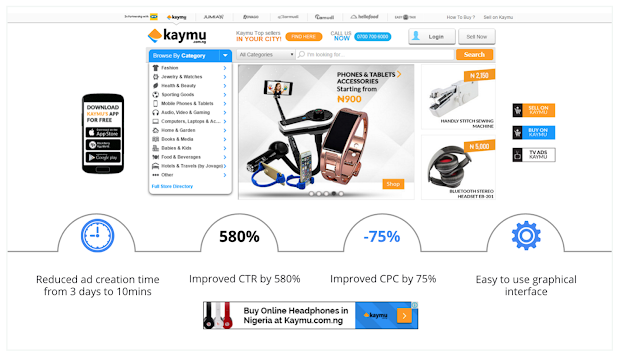 Kaymu, one of the largest online retail marketplaces for emerging markets, used Google Web Designer to build an HTML5 dynamic remarketing campaign and show relevant products to shoppers. This strategy drove a 580% increase in CTR compared to their previous, non-HTML5, non-dynamic campaign, and the team’s dynamic creative build time dropped from 3 days to 10 minutes. CyberAgent, a media agency based in Japan, also used Google Web Designer for a recent dynamic remarketing campaign. To provide the time needed to focus on the creative strategy, the team first automated the bidding and targeting for the campaign. They then could build and test several dynamic templates, using advanced animations and multiple dynamic elements. Ultimately, these advanced creatives led to a 40% higher CTR and a 28% lower CPC compared to the previous dynamic remarketing campaign that didn’t use Google Web Designer. Want to learn more about the new features? Sign up for one of our Hangouts on Air. Sean Kranzberg, Engineering Manager for Google Web Designer, will walk through the new features and take your questions. When advertisers pay for an ad, the chance for it to be seen is a basic expectation. Advertisers shouldn’t have to pay extra to measure and ensure that it was viewable. These expectations drove the launch of Active View back in 2013, an effort to establish a neutral and common set of viewability metrics used by both advertisers and publishers. Since then we've continued to invest in this technology across DoubleClick, YouTube and the Google Display Network, and today we're happy to share two new updates that will help advertisers and publishers run more effective cross-screen campaigns. Today, we're introducing Active View bid optimization in DoubleClick Bid Manager for clients globally. This new bid optimization feature uses the collective intelligence from many signals (e.g. URL, time of day, page category) to predict, impression by impression, the probability that it will be viewable. It then dynamically adjusts bids higher or lower based on that probability to deliver the viewable CPM target that advertisers set for their video and display campaigns. Active View optimization delivers what advertisers actually care about - the total volume of viewable impressions - and doesn’t fixate on a viewable percentage. This will help solve a common problem: when marketers buy viewable impressions programmatically using current viewability targeting, the decision to bid on a single impression is very basic. Buyers choose a target viewable percentage (e.g. 50%) and their programmatic buying system bids the same amount for any impressions with a likelihood of being viewed above that target - or nothing at all for impressions with a likelihood of being viewed below that target. This means that buyers are missing out on wide swaths of inventory that may actually be viewable and are driving up competition (and CPMs) for the inventory they are buying. We believe that viewability metrics should be a standard currency between buyers and sellers. To enable this, we've been investing in features that allow publishers to see and report on a holistic picture of viewability across their channels and content. We're continuing that momentum today by announcing Active View reporting for mobile apps in DoubleClick for Publishers and on the DoubleClick Ad Exchange. With the consumer shift to mobile reshaping how publishers engage with their audience and those interactions increasingly happening on mobile apps, this new measurement solution completes the picture for publishers helping them see how viewability plays out across all of their properties. At Google, we remain committed to investing in a broad set of measurement solutions for brands and publishers through a combination of product innovation with our own solutions and partnerships with leading third parties. These announcements are two big steps in our ongoing effort to help our clients measure every moment that matters. Since its beginnings in 1999, digital marketing agency Jellyfish has been at the forefront of digital advertising, helping clients of all shapes and sizes succeed in digital. 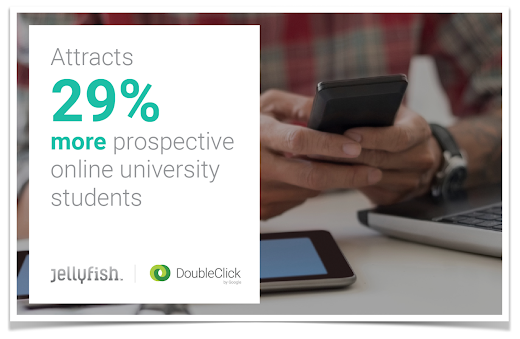 Most recently, Jellyfish partnered with a leading international online university who wanted to attract prospective students using online search. To meet the challenge, Jellyfish turned to DoubleClick Search and its ability to respond in real-time to optimize performance as the best tool for the job. Hit regional lead volume and cost-per-lead goals. Tailor bid strategies by region with the Performance Bidding Suite. Use bid strategies to respond to real-time, data-driven feedback including online and offline conversions. Deploy best practices with bid strategies. Increased lead volume by 29%. Decreased cost per lead by 84%. Effectively generated quality leads for the university's search program internationally. To learn more about Jellyfish’s approach, read the full case study. Last week, the Trustworthy Accountability Group (TAG) announced the “Verified by TAG” initiative to help increase transparency of digital advertising transactions across the industry. We’re fully supportive of both programs outlined in TAG’s announcement and we’re currently in the process of applying for TAG Registration. To support the adoption of Payment IDs across the ecosystem, starting today our version of Payment IDs is available in DoubleClick Ad Exchange to all buyers globally. Currently, if a programmatic buyer finds they’ve bought fraudulent inventory, there is no way to directly identify the supply source responsible for the fraud. The Payment ID system we proposed to the TAG Anti-Fraud working group fixes this problem by asking all supply sources (e.g. ad exchanges, ad networks, supply side platforms) of advertising inventory to create and provide unique and persistent anonymous identifiers that link every impression to who is paid in their accounting systems. If a buyer finds invalid activity from any source in their supply chain, these Payment IDs will help the buyer to identify who is responsible and blacklist those suppliers from their campaigns. We’ve always invested heavily to keep DoubleClick Ad Exchange free of invalid activity and ensure that money spent on our platform only goes to support legitimate publishers, app developers, and content creators. To show our commitment to a better ads ecosystem, accelerate the adoption of Payment IDs, and help DSPs start integrating them, we’ve implemented the standard as it exists today, and we’ll continue to work closely with TAG and others in the industry to formalize an industry-wide Payment ID program. When the TAG Anti-Fraud Working Group has finalized the broader industry standard, we’ll happily make any changes to ensure we are compliant with TAG’s efforts. "Google has been at the forefront of the fight against digital ad fraud, and this announcement advances our work together to develop an industry-wide Payment ID system. We look forward to continued collaboration with Google and other programmatic leaders through the TAG Anti-Fraud Working Group to create a fully transparent digital ad supply chain that will expose the bad actors and cut off their financial support." Leading programmatic buyers, DoubleClick Bid Manager, Dstillery, Magnetic, MediaMath, Rocket Fuel, The Trade Desk, and Turn have all committed to integrating Payment IDs into their systems in the coming months. If you can’t measure it, how do you know it worked? With this simple principle in mind, we’ve been investing in a broad set of measurement solutions for brands through a combination of product innovation with our own solutions like Brand Lift and Active View and partnerships with leading third parties like comScore and Nielsen on GRPs. Viewability has long been a focus for us. Built on the foundation of our Active View technology, we launched the ability to buy only viewable impressions on the Google Display Network back in December 2013 and recently completed moving over the last advertiser campaigns from CPMs to viewable CPMs. We’ve worked to ensure viewability rates on YouTube are amongst the industry’s highest. And Active View now works seamlessly across video, display, mobile web and mobile apps (on YouTube and for publishers using DoubleClick for Publishers), and has been adopted by over 80% of advertisers using the DoubleClick platform. With the MRC-defined industry standard as a base-line for viewability, we are also helping advertisers and agencies go beyond transacting on the industry standard to also measure individual viewability objectives. In order to support this we have begun launching supplementary metrics in Active View, like the ability to see average viewable time and soon when an ad is 100% in view for any length in time. These are the first few in a lineup of supplementary metrics that will provide advertisers with additional data points relevant to their specific campaigns and needs. Today, we're continuing our approach of driving product innovation and supporting choice by announcing that we're broadening the options for advertisers measuring viewability on YouTube. Along with Active View, advertisers will also be able to choose from third party vendors. Moat, Integral AdScience, comScore and DoubleVerify are a select set of third party vendors that have been approved to report ad viewability on YouTube, beginning with Moat in early 2016. Through these partnerships, we’ll continue to expand measurement options for marketers on YouTube, while maintaining the highest levels of security and privacy for users, advertisers and creators. "Having partners like Google address these challenges helps to push the entire industry forward. This move will generate better industry-wide standards across viewability and third party verification practices and continues the momentum in the right direction." Stay tuned for continued investments in the viewability space, including ongoing product innovation updates to Active View as well as additional partnerships. Together with our partners, our goal is to help our clients measure every moment that matters. The holidays are a critical time of year for search marketers, as consumers increasingly research and complete their holiday shopping online. To help you win the moments that matter this holiday season, we recently announced several new features and the DoubleClick Search Guide to the Holidays. Today, we’ve got another special gift to continue the holiday spirit: Bing Shopping Campaigns are now part of the DoubleClick Search Commerce Suite. Bing Shopping Campaigns for Bing Ads make it easier and faster to advertise your products from your Bing Merchant Center store online. This streamlined way of getting Product Ads up and running on Bing is also driving meaningful impact for advertisers. With the addition of Bing Shopping Campaigns to the DoubleClick Search Commerce Suite, you can easily extend the reach of your product-focused advertising. You’ll be able to manage, automate, and measure Bing Shopping Campaigns using the full range of DoubleClick Search tools, the Performance Bidding Suite, Adaptive Shopping campaigns, and Purchase Detail reports. Learn how to get started with Bing Shopping Campaigns in DoubleClick Search today.